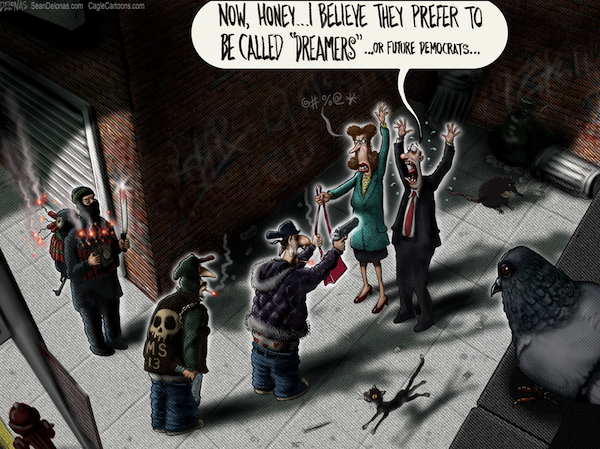 Here's a write-up from the paper that chose to print Sean Delonas' latest cartoon, which equated those that fall under the "Dreamers" designation with a) thuggish criminals, b) future Democrat Party voters, kind of a cynicism and racist-through-extreme-example cartoon lasagna. Pushback has already come from elected officials. One might remember Delonas from his appalling cartoon equating President Obama with a chimpanzee murdered by police, which I'll note to Delonas' benefit at least sucked in a different way. The cartoon in question seems cloddish and unimaginative in its straight-up 1970s-style depiction of its political position that it's hard to imagine anyone thought it achieved an effect worthy of running it in a newspaper. I'm sure now that politics are sports there are all sorts of defenses people have if that cartoon represents their home team. I look forward to a day when all of our editorial cartoonists add to a discussion through their work, in whatever way they wish, rather than replicate an abstracted stance within that discussion in as dull a way as possible.